Paris in June. Some come for the shopping, the museums, the sidewalk cafes, the romantic evening strolls through the city of light. And then there’s the crowd that’s jonesing for the hangar-and-asphalt vibe of Eurosatory, the massive biannual military bazaar that sprawls over the exhibition grounds near Charles de Gaulle airport. The exhibition is designed to be a showcase for European land systems companies, but it is also the best hands-on venue for the latest technology and innovations in Israel’s often-secretive defense industry. Winning the “and now for something completely different” award, Tel Aviv-based Netline Communications Technologies introduced one of the smallest jammers ever made for stopping improvised explosive devices. Perched on the counter of the modest company booth was the modestly named Portable Jammer Pack (PJP), a roundish object about the size and shape of a medieval fire-pot grenade and intended for use in urban spaces. For IED suppression, “urban operations are tricky because of access issues to crowded streets and tightly packed buildings and the need to get jammers to places where equipment with regular antennas cannot go,” explained Loreen Haim-Cayzer, a Netline executive. 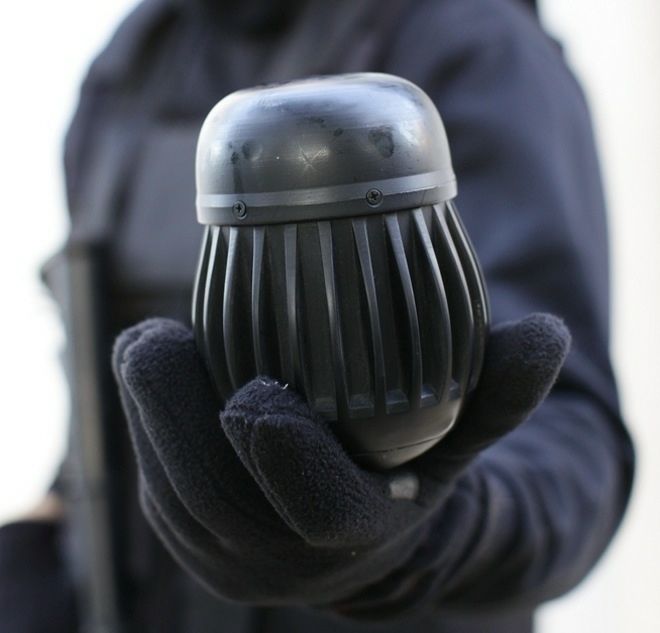 Enter the PJP, which can be deployed via the Mark I overhand grenade toss through a window (e.g., before a building intrusion) or down an alley (e.g., ahead of a patrol). But if you need to hurl it across the block or over that three-story building, best to hand it off to the former high school pitcher in your squad, since it still weighs in at a solid 2.5 pounds. Netline developed the PJP after a NATO customer asked for a “handball sized” jammer that elite units like special forces could carry in an urban operation, said Haim-Cayzer. To produce something small enough to clip on a belt, engineers needed to miniaturize existing jamming modules and print the antennas on the circuit boards inside the unit. Designers cushioned the system with rubber to absorb impact. Since it can blast away for an average of 30 minutes on its rechargeable batteries, this led to some overheating issues, so the engineers added a heat-absorbing element in the internal battery compartment. In the field, the user turns on the PJP by pulling its safety catch, hand-grenade style. After landing, the jammer weeble-wobbles upright and throws ‘trons to disrupt any nearby communications device being used as a remote IED trigger, like a jury-rigged cell phone. Tech support would have programmed the unit beforehand (it plugs into a laptop) to block specific channels and define other parameters customized to the mission. If all goes well, the user can scoop it up and bring it home to be reprogrammed for the next mission. That’s the theory, at least. The PJP currently is undergoing operational tests, said Haim-Cayzer. Danger Room was curious about the effective radius of the PJP and the risks of communications fratricide in a close-quarters signal environment, but Netline declined to elaborate on these issues.